This overview paper deals with selected economic aspects of EU enlargement related to Austria and the five Central European countries: Czech Republic, Hungary, Poland, Slovakia and Slovenia (CEC-5). Since the fall of the Iron Curtain, Austria has been enjoying over-proportionate gains from liberalized trade and capital flows. EU enlargement will cement and further increase these gains. However, the current weakening of the EU economy could adversely affect the climate for enlargement just at a time when accession negotiations are entering their most difficult phase. The CEC economies will grow by about 3 to 4% on average in both 2001 and 2002, a marked deceleration of growth is forecast only for Poland. Most CECs suffer from high and growing unemployment. In Austria, economic growth is set to decelerate to 1.3% in 2001 and may pick up slightly next year while unemployment will remain low. CEC candidates' benefits from EU accession will be large in the short and medium run, though their costs associated with the takeover of aquis communautaire will also be considerable. Estimates of the implications from the full participation in the European Single Market show that EU enlargement is a win-win situation. The CECs will on average gain around ten times more than the EU. 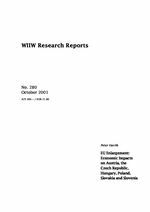 Hungary and Poland may increase their real GDP by an additional 8 to 9% over a ten-year period (including the pre-accession period 2001 to 2004), the Czech Republic gains somewhat less (4 to 6%), just as Slovakia and Slovenia. Austria is probably the biggest enlargement winner among the EU member states; it could additionally gain some 0.7% of GDP. The stronger growth impact of enlargement in the CECs spurs their income convergence and thus reduces the migration potential. The overall impact on the EU labour market should be limited. For Austria, the number of residents from CECs is estimated to increase from around 1.3 % of the Austrian population to 5.5% in 2030. Due to similar demographic trends in both the present EU and the CEC candidates, migration/labour shortages may become a major source of concern in CECs as well. Blocking inward migration while outward migration continues could negatively affect both economic growth and the stability of social security systems. Political considerations play a crucial role in this segment of accession negotiations. Austria is among the leading trading partners of the CECs. Exports to this region amounted to nearly EUR 8.5 billion in 2000, the Austrian trade balance with the CECs has traditionally been in surplus. Trade with CECs has a clearly positive impact on both Austrian output and employment. By the end of 2000, nearly USD 80 billion of FDI entered the CEC-5, of which about USD 6 billion (7% of the total) came from Austria, creating favourable conditions for further economic expansion. Additional trade effects of EU enlargement are bound to be limited. FDI-related trade exchanges will grow and one may expect increases in services trade. Intense economic co-operation shows that the current political disputes between Austria and some CECs apparently do not affect decision-making processes at company level. In sum, economic data confirm the growing importance of regional integration in Central Europe and its benefits for all countries concerned.